First, measure your length, giving a little more to tie it together when you are done. Cut your foam rollers in half with scissors. Start putting on beads, and every 3-5 beads put a clip, lanyard or a foam roller. Place things evenly for balance and design. The beads are there to separate out the lanyards and clips, giving room to whatever gets clipped on there, so keep that in mind as you place your beads. Intermittently slip on a foam roller, and do this evenly as well. You only need 2-4 of these on the lanyard. The keychain clips need a small jump ring placed on the key ring part, then slipped onto the necklace. Otherwise, the ring will be too large and the beads won't hold it in place. I urge you to be creative! Use different kinds of beads, or even fish themed beads to make the gift more special. Or if it is from a child like ours, plan to use alphabet beads on it for a special message. Plan to know where to place them as you build out the necklace so they are placed in the right spot. This is just an awesome idea for a gift! There are so many applications from this simple post. I love it! Thank you Amy! My husband is still raving about the gift we gave him. And he is having good use out of it this week lake fishing in Michigan. Out of all the gifts we gave him ranging in extravagance, this is by far his favorite to date. The design of your crafts are awesome. Thanks a lot for sharing your ideas. Thanks Dale! I appreciate the feedback. This one was fun because I was able to get my daughter involved (not always easy to pull her away from her nintendo). Thanks for stopping by. Please come again! I am going to try this as a lanyard for my 16 y.o. son's car keys! He loves fishing! Cool, great idea! Thanks for stopping by! Please come again! 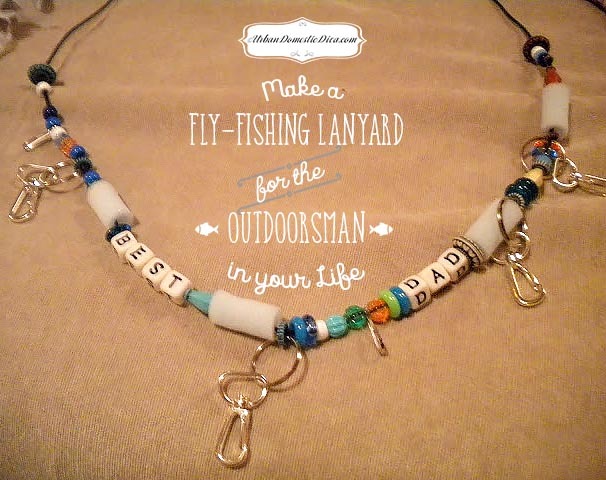 I am a fly fisher and I was going to buy a lanyard. Now I will make one, i love the idea of personalising my own and having a unique design. Great idea thank you. Tight lines. Happy to inspire! My fisherman hubby loves his! Thank you for stopping by!